In Growing a Farmer, Kurt Timmermeister recounted the toil and joy of wrestling an empty plot of land on Vashon Island, Washington, into a dairy farm. Now he tells the story of a feast made from only what the farm provides. But the story of the meal begins two years earlier with the birth of a calf, Alice. When she is grown, Alice will produce the cream to be churned into butter, made into sauce Bearnaise, and served alongside poached eggs and kale gathered the morning of the feast. Along the way we meet Leda, who trades onion seedlings for Kurt's cheese; Michiko, who forages the white chanterelles for the antipasti course; and Bill, whose large, thin-skinned tomatoes will form the basis of the tomato upside-down cake. 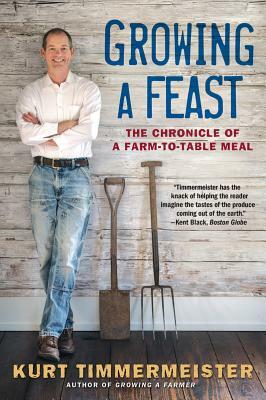 Rich in detail, resonant in story, Growing a Feast depicts the effort behind every meal, the farm that comes before every table.